As the winner of the third prize, Steckel had a choice of either the same PowerLuber & PowerLock Pack from the first two giveaways or a FLO Components “18-point Automatic Lubrication System in a box”, which according to Lopez is a complete automatic lubrication system kit capable of servicing up to 18 lubrication points on a piece of stationary or mobile equipment in many applications. 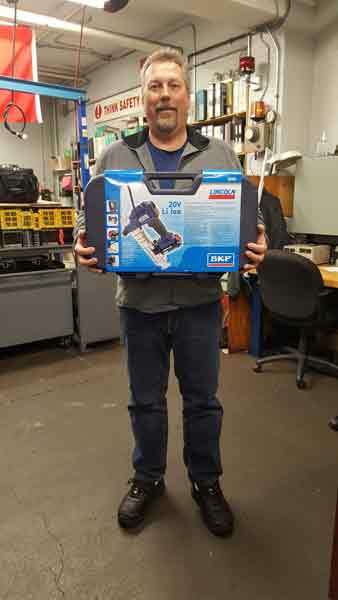 Steckel chose to receive the Lincoln 1884 PowerLuber & Lincoln 5900 PowerLock Coupler Pack. To find out more about the contest or the prizes given away visit: www.flocomponents.com/40th/ FLO Components Ltd. is a lubrication systems specialist and a leading supplier of “Total Lube Solutions” to major industrial manufacturers, food and beverage, trucking, mining, construction and road building companies and other heavy equipment users in Ontario. Established in ON in 1977, FLO uses application expertise and qualified service technicians to provide cost effective Solutions for all types of lubrication and fluid handling applications and help clients reduce unscheduled downtime and improve productivity.